So excited to see this book come out. Can't wait to read it! What an achievement! I love how you reveal specific sensory details. Hooray for you for enabling these people to "step out of the fog of history and stand in the bright light of recognition." In working on a New Hampshire women project, I spent a little time researching Oney Judge. A fascinatingly brave woman. Your book sounds very interesting and I appreciate learning how you approached the writing of it. I have been hearing about this book and am very excited to read it. I visited Mount Vernon not many years ago and new there were wonderful stories there to be told. So glad you decided to write this book. Thanks for the post. 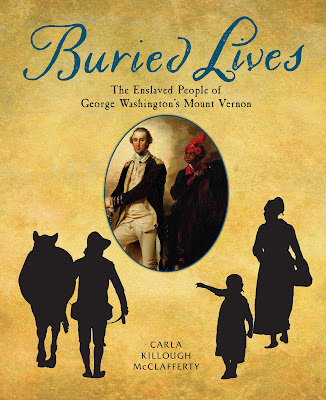 BURIED LIVES is now in the world. You worked so very, very hard, Carla, to ready this book. The book sounds fascinating. I think everyone in our family would be interested in reading it. Congratulations on your publication. I am fascinated about this time period and want to teach my students the true stories of enslaved people. I know I will learn so much from your book. I already have from your post about this important book. I can't wait to read it and feel the hoe in my hand too. Congratulations on your publication! I always find that little-known history is the most surprising and interesting. Thanks for the chance to win a copy! Carla ~ MAZEL TOV! Thank you for taking us on your Buried Lives journey. There's so much to love in your post, I can't wait to read the book! Thank you April. At last now that the book is almost out other people can know what I’ve been referencing when I’ve written about it and talked about it. Exciting book. I attended Georgetown University which benefited from slavery, so I find the subject very important. If I won the give-away, I'd use the book for my student at George Manierre Elementary in Chicago's Reading Buddies program. As a professional educator and a school teacher librarian, I am excited about great nonfiction books. I always encourage my students to seek out nonfiction because a well-written nonfiction account that reads like a novel makes a greater impression since you KNOW it actually happened. I was so impressed with the author's research and the way she stepped into the shoes of the people she wrote about. If I am fortunate enough to win this book, I will not only add it to my library's nonfiction section, but also actively promote it to my students. This book sounds like it will be very informative! I have always been fascinated with George Washington, partly becasause I was born on his birthday! I am looking forward to getting this book and sharing it with my students! Thank you for taking the time to do the research and share what you learned. I went to a breakout session Ms. McClafferty did at an ArLA convention in Little Rock a few years ago where she was discussing her research of the book and how she went about doing it. Ever since this I have been waiting for this book to come out! I am very excited to be able to read it now!! Thanks for all of your research! Many congratulations on the book! I'm delighted that these people once unknown to us have a moment to allow us in. I tell my students all the time that there is still history to be discovered. I love that you have brought us these stories. I truly believe that the hand of God was all over this project. This book will be a most helpful tool in my mission/ job of interpreting and narrating the lives of the marginalized and enslaved persons. I count it a joy to be able to do this. If I recieve this book, in addition to using it as a reinforce and support my narrations and story telling on the estate, it will become an heirloom for my grand child who if of many mixed heritages. I can't wait to see this eautiful work of art and heart. It has been so valuable to me as a writer to follow your journey Carla with this book. My granddaughter, age 10, loves history and begs me constantly to tell her "more about when..." whether it is colonial America or World War II. I will give her this book, but will want one of course for my own. Congrats on a wonderful book. Congratulations, sounds like an interesting read!